Five sanitation workers, all from the lowest rung of India’s caste system, were chosen in late February to meet a very important guest: Prime Minister Narendra Modi. As cameras flashed, Modi proceeded to wash the feet of the workers, one by one, using water and his hands, a gesture intended to honour staff who clean toilets at the Kumbh Mela, a massive religious gathering in north India. But sanitation workers, scores of whom die each year from asphyxiation while removing waste from underground drains, have had enough, said Bezwada Wilson, the head of the Safai Karmachari Andolan (SKA), or Sanitation Workers’ Movement. Ahead of general elections that begin on Thursday, the workers are reminding Modi of his promise to eradicate by this year the practice of manual scavenging — the cleaning, carrying or disposing of human excreta from dry latrines and sewers. “(Modi) has done nothing for us in the past five years,” Wilson said. India has laws banning the hiring of manual scavengers, but they have not been properly enforced, mostly due to difficulty collecting evidence and apathy by successive governments. Workers picking up human waste with bare hands is a common sight at railway stations. 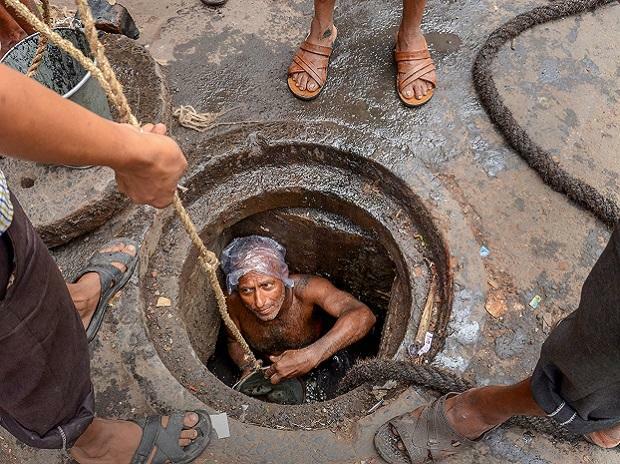 While government estimates peg the number of manual scavengers at anywhere between 14,000 and 31,000, the SKA says the figure is closer to 770,000, with nearly 1,800 sewer cleaners asphyxiating to death in the last decade. The community has little political power and Modi remains the front-runner to win the election, but critics point to their condition as another example of lofty promises undone and the empty symbolism of washing their feet. Wilson has launched a hashtag #StopKillingUs on Twitter and demanded government help workers find jobs that give them dignity. Most sanitation workers find it difficult to get other work because of caste-based barriers, while many operate without formal contracts and are unaware of the terms of their employment, a study by US-based advisory firm Dalberg shows. The workers whose feet Modi washed in February are not satisfied with their jobs and want an end to manual scavenging, they told the Indian Express newspaper last month. More than 90 percent of latrine cleaners are women, and all sanitation workers are Dalits, the social group at the bottom of India’s caste system.